Will the German Army, Fight in Syria? What will happen if the Syrian rebels in Idlib are attacked with poisoned gas? Germany does not rule out the possibility of participating in punitive measures. Talks on this issue have been made. Will the German army, Bundeswehr, participate in the fighting against government troops in Syria? What may seem difficult to imagine has long been discussed by experts from the German Defence Ministry. The German army will take part in air strikes if the Damascus government will use poison gas against the last rebels' castle, Idlib. This is something that experts do not see as impossible, at least in the last period. Three million people would be affected by this. If the situation gets worse there, then a large number of people would return to refugees. And many would die. All diplomatic efforts to mitigate the situation have failed so far. 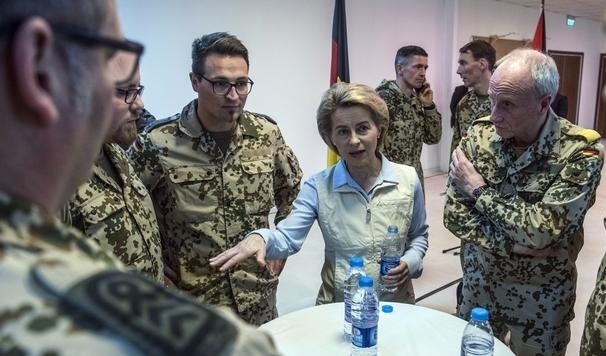 "Decisions are also discussed with partners"
According to Monday newspaper reports, the German government has already spoken to the allies in Washington, Paris and London about a possible participation. Chancellor Steffen Seibert also confirmed that "The German government is of course talking to partners and allies, because considering the situation in Idlib, the worries are great, that the terrible patterns from other Syrian fighting squads could be repeated." This can really cause a new situation for Germany. In April, the United States, France and Great Britain responded with air attacks on the possible use of poisoned gas. Without the German participation, because the government in Berlin had stated, inter alia, that was not asked for such a thing. It seems that now this has changed. But even if major constitutional hurdles are now required, they remain against a possible German participation. Concretely, Bild newspaper wrote on Monday that German army tornadoes are ready to attack. Germany has participated in military attacks in Syria so far with tornado flights discoveries, though only in the positions of extremist IS militias. The extending of the participation, now also in the Syrian army positions, requires parliament's approval. It is not certain if it will be achieved. Conscientious approval for each case was given by the chairman of the Liberal Party FDP, Christian Lindner, on Monday: "The use of weapons of mass destruction of poisonous gas is a crime against humanity that needs to be persecuted by the international community If the international community decides this, Germany can not stand aside." But Lindner added at one and the same time: The Bundeswehr State and its tradition do not allow an "offensive" participation. For the left, faction leader Dietmar Bartsch stated categorically: "I think that now, something is wrong about the Germanaid". Of all German ministries that could be affected by a German participation, Monday's statements on this subject were released. The government, which is under great pressure due to asylum and refugee policy, can not allow new conflicts. Because the leader of the Social Democratic Party, Andrea Nahles, reacted with a clear "no" about relating to a German participation. And the Social Democrats are part of the government. Do not push us into troubles, the faces of the government representatives said no Monday.